This is Baby Hans. 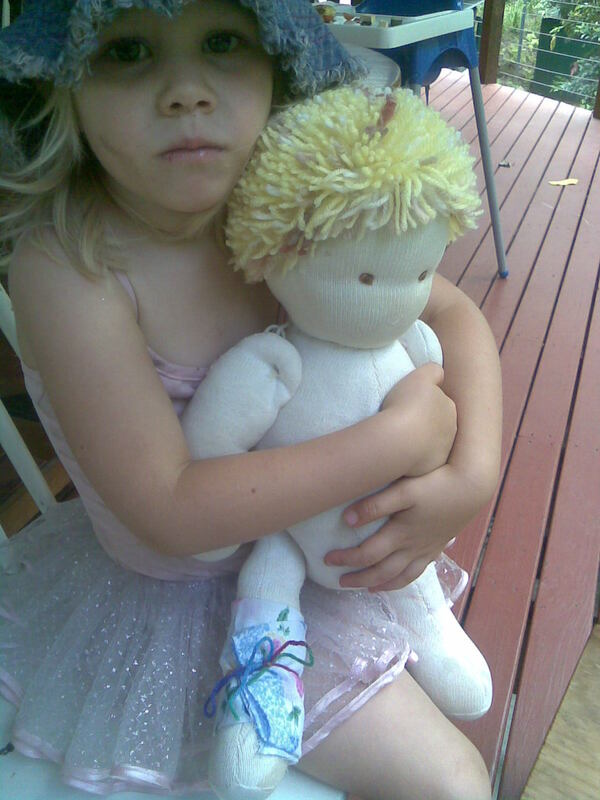 He is the original Lavendilly Doll, made before my first child was born, 8 years ago. In that time he has been loved and hugged, left lying around, lost, done a bit of gardening and a bit of drawing too. He has been washed many times and has many a long soak in a nice warm (lightly bleached) bath. 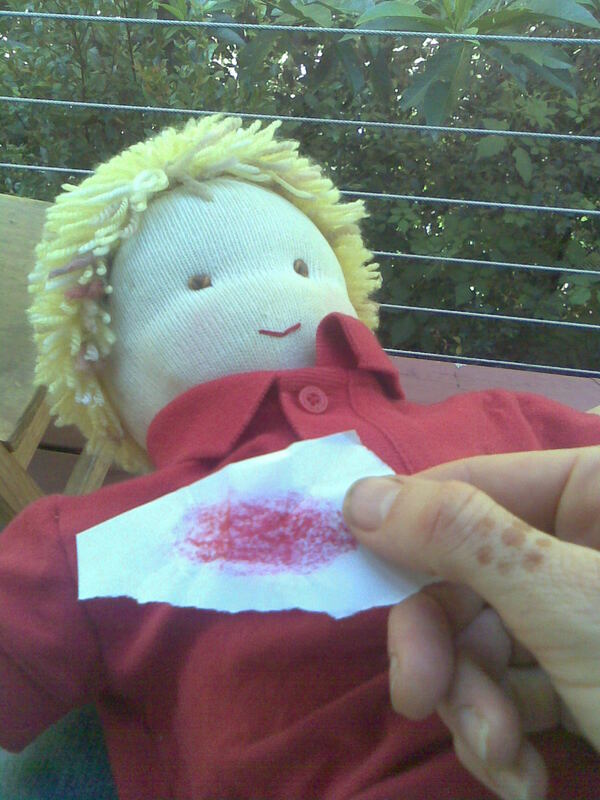 He is proof that Lavendilly Dolls last and are loved even when they are a bit grubby. With my tool kit nearby I was very gentle, and his leg felt much better soon. I talked to her about how her finger was stitched together by a doctor with a needle and thread when she was a baby and she had caught her finger in a door hinge. macabre conversation maybe, but this child is a bit melancholic and it seemed appropriate to share the experience with her baby. What I was a bit anxious about sharing with her, however, was the next part: re-attaching Baby Hans’ arms and legs. 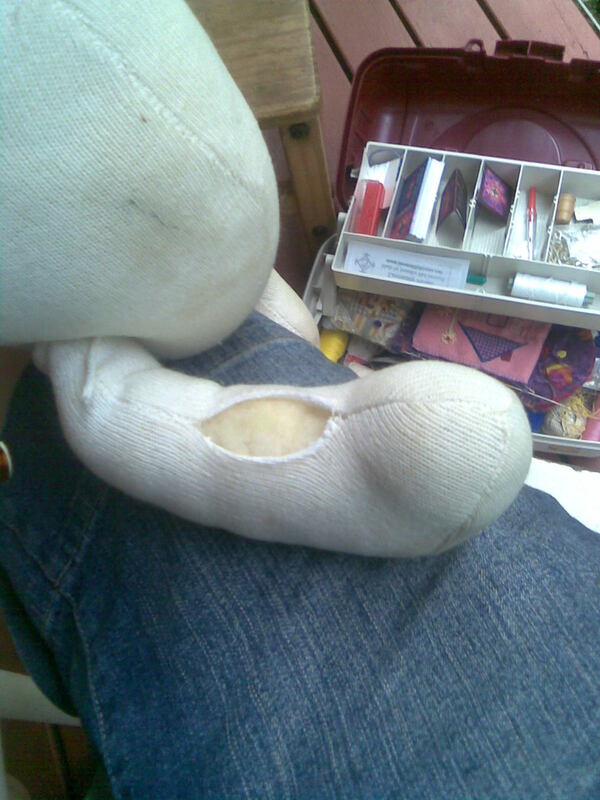 They would need to be snipped off and re-attached with the doll needle. 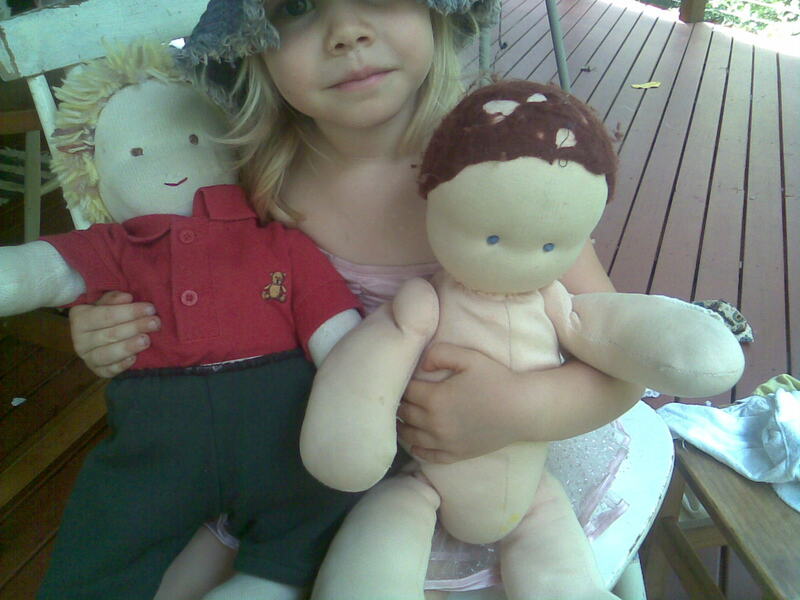 The previous night, at my Craft Night, I was asked if I ever made the dolls while the children were watching. My answer was no – they might see bits of unfinished dolls, and they have seen me stuffing parts or making hair, but the bits that involve using those gigantic doll needles I have never completed in the presence of children. Those needles make me squeamish – I can’t imagine the effect upon a child watching unattached limbs or a blind doll head being stabbed with needles as long as my hand! I’m still not going to do it again. I snipped the joint thread between his legs and his body and pulled all the old threads out. If Rosella wasn’t watching, and if I had more time I would have re-stuffed his legs a bit too. Then I threaded the doll needle (see what I mean about how long it is!) with a really long piece of strong linen thread (which I buy HERE). I took the needle straight through one leg, the body, through the other leg, and pulled it out the other side. Then I inserted the needle about 1cm away from where it came out and brought it back through the 2nd leg, through the body and through the 1st leg, coming out about 1cm from where the thread entered the 1st leg. I pulled the thread tight and tied it in a double knot. Then I re-threaded each end of the linen thread separately and brought them back through the 1st leg, the body, and out the 2nd leg, where I tied them together tightly in a double knot. Then I brought each of the ends out underneath the leg, close to where the joint was made and snipped the thread very close to the fabric, where the end will disappear into the stuffing and won’t be left hanging out. Nice and neat. I trimmed his hair a bit (gave him the equivalent of a #3 buzz cut) and gave him a new mouth, as the thread of his old mouth had faded so much that you couldn’t even see it. Then we gave him a bit of colour in his cheeks, which really made him look happy! This was done by rubbing a bit of crayon on some paper and then lightly rubbing the paper in a circular motion on his cheeks. It is good to practice on a bit of unwanted fabric first. 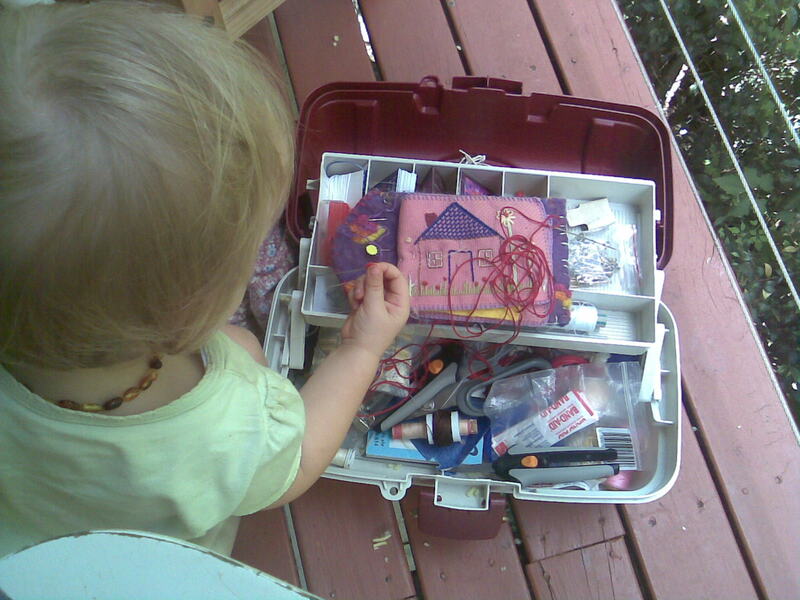 All this took a bit of time, because as you can see my littlest assistant came along to sort through my toolbox. She’s still in training, and actually, she isn’t very helpful yet. Thanks for your positive and inspiring voice on EARLY PLAY AUSTRALIA this year. Wishing a great time with family and friends.